The images of this video were calculated from the satellite's raw data to match human perception as closely as possible. Since the satellite does not use a commercial camera for the recordings, but a so-called Multispectral Camera , true color images had to be calculated using special algorithms. Stop the animation by setting the slider FPS to 0. With the slider Img you can select a specific picture. With FPS = 8.33 the animation runs as fast as the video above. If you combine the 3 RGB channels of the Multispectral Camera of the satellite without editing, you will get the pictures shown above. In these pictures the vegetation is not displayed correctly, because the three RGB filters are not aligned to the human visual spectrum, but to wavelengths optimized for weather data. Note the reflection of the sun on the surface of the earth. The South Pole is illuminated for 24 hours at this time of the year, meaning the sun never sets. Incidentally, even the oblateness of the earth can be measured accurately on the high-resolution infrared images of the satellite: Can we see the Oblateness of the Earth on Satellite Images?. The animation above shows the real proportions of Earth and the distance of the satellite at November 25. 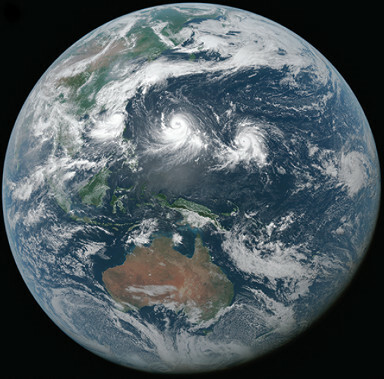 The position of Himawari 8 is 140° east at a distance of 35,786 km from the earth's surface above the equator. The satellite orbits the Earth synchronously in a geostationary orbit. That is, he always shows exactly the same view of the earth. The animation shows why the sun never sets in the antarctic summer at the South Pole (Antarctica). From the satellite's point of view, the sun is always below its orbit at this time of the year. Therefore, the sun's reflection in the images is always in the lower half of the globe. In reality, the orientation of the earth axis does not change when the date is changed. Here, a coordinate system was chosen, which always shows the earth from the same side in relation to the Earth-Sun connection. So this coordinate system rotates with the Earth around the Sun, so it seems like the Earth's axis is turning. Himawari 8 is a weather satellite of the Japanese Meteorological Agency JMA (Japan Meteorological Agency ). 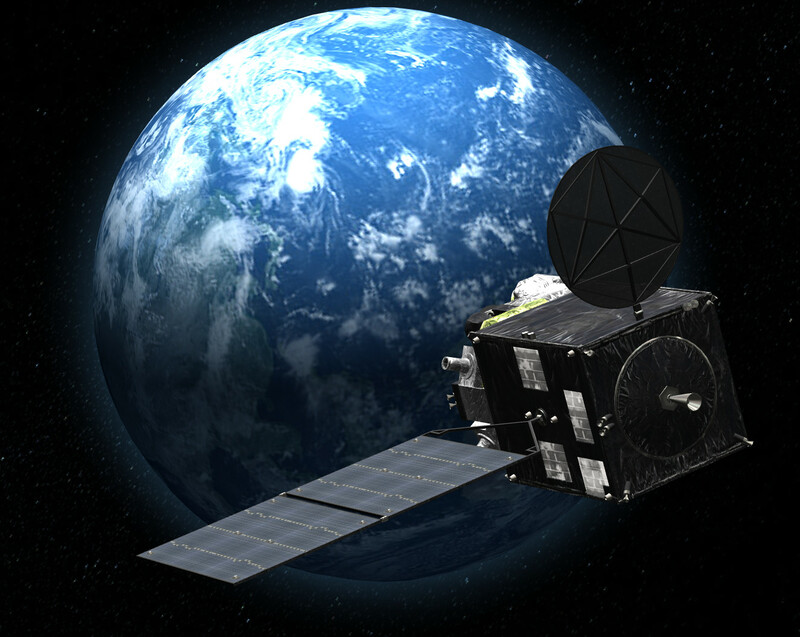 The satellite was manufactured by Mitsubishi Electric with support from Boeing. It is the eighth geostationary weather satellite in Japan and the first of a new series. 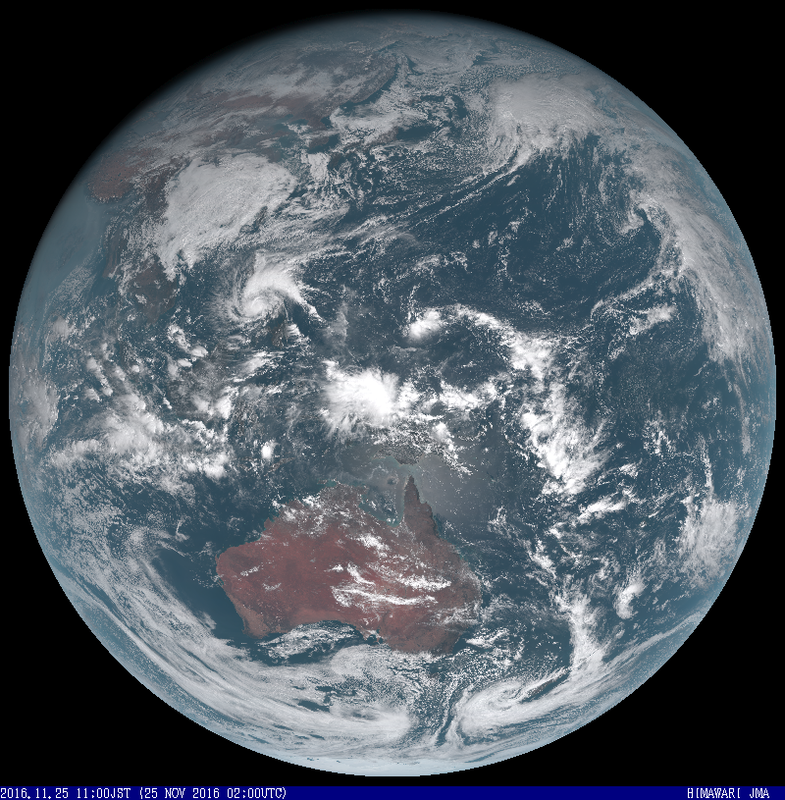 Himawari 8 was brought into its geostationary orbit on October 7, 2014. It flies at an altitude of 35,800 km above the equator at 140° East, has a length of 8 m and a weight of 3.5 t. He officially went into operation on July 7, 2015 . Himwari-8 Real-Time Images opened at 03:00 UTC on 3 July 2015 . True Color Reproduction was added on 10 May 2016 . The image data is sent to various institutes which process the images to produce, for example, true color images, infrared images and weather maps . The Advanced Himawari Imager (AHI) is a Multispectral Camera with sixteen channels (0.46 µm to 13.3 µm) in the range of visible light and in the infrared range and provides overview and detail shots. The images reach a resolution of up to 500 meters per pixel. 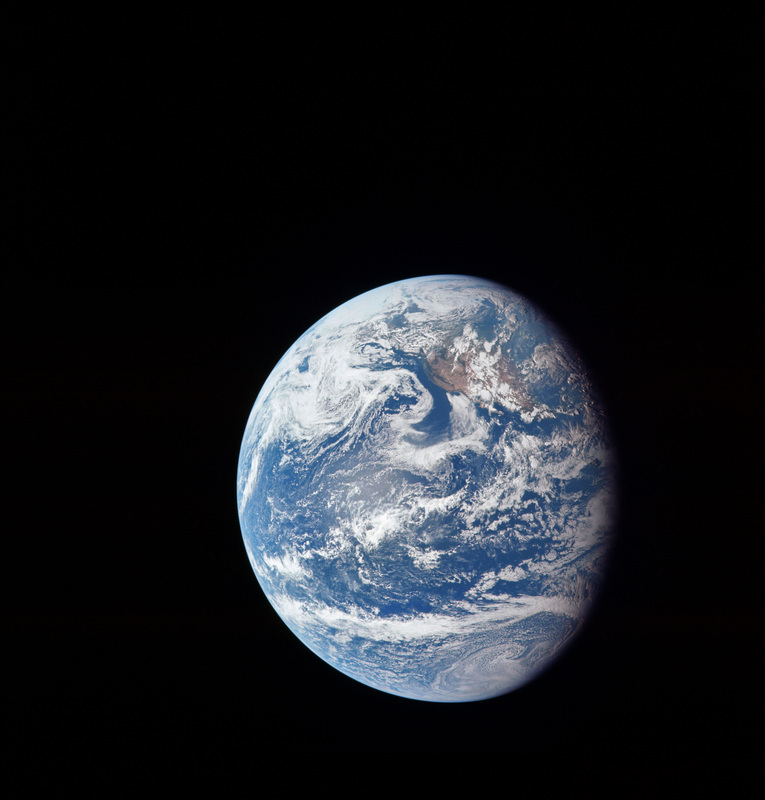 It can record the whole earth at 10 minute intervals with 11,000 x 11,000 pixels resolution (approx. 1 km per pixel) and the japanese teritorium all 2.5 minutes. The camera provides cloud, temperature, wind, precipitation, and aerosol distribution data over the various spectral ranges   . A photo or video camera has sensors that are sensitive in the visible spectrum of the light. The spectrum is recorded with 3 overlapping independent channels which delivers gray scale image data for each of the color channels: red, green and blue. If these channels are superimposed, a so-called true color image is recreated. Satellite sensors, with exceptions, are not primarily sensitive to electromagnetic waves in the visible region of the spectrum. Specialized satellites such as weather satellites are particularly sensitive in those spectral bands that provide specific data such as cloudiness and temperature. Weather satellites therefore have bands predominantly in the near infrared and infrared ranges. To graphically display the data, they are mapped to the bands for the three primary colors red, green and blue. This creates so-called false-color images. In addition to the infrared bands, the AHI camera also has 3 bands in the visible range. Therefor it is the first time cince 50 years that true color images of the entire earth can be made with a weather satellite. But there is a small technical problem: The green band does not overlap with the red band (Fig2), so a large amount of green/yellow/orange is missing on the pictures and forests look like red/brown deserts. 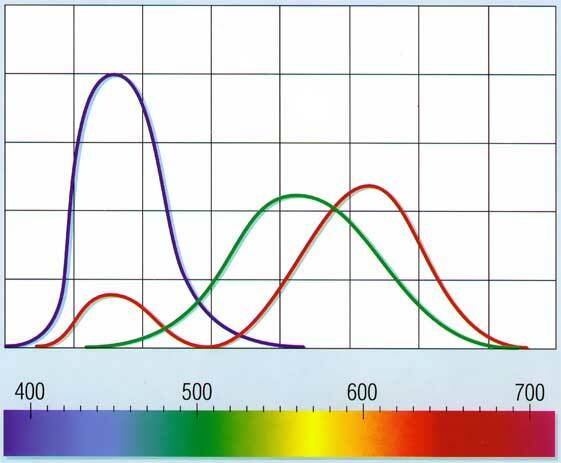 Fig1: The three types of color-sensitive retinal cells (cones) are excited by different wavelengths of light. 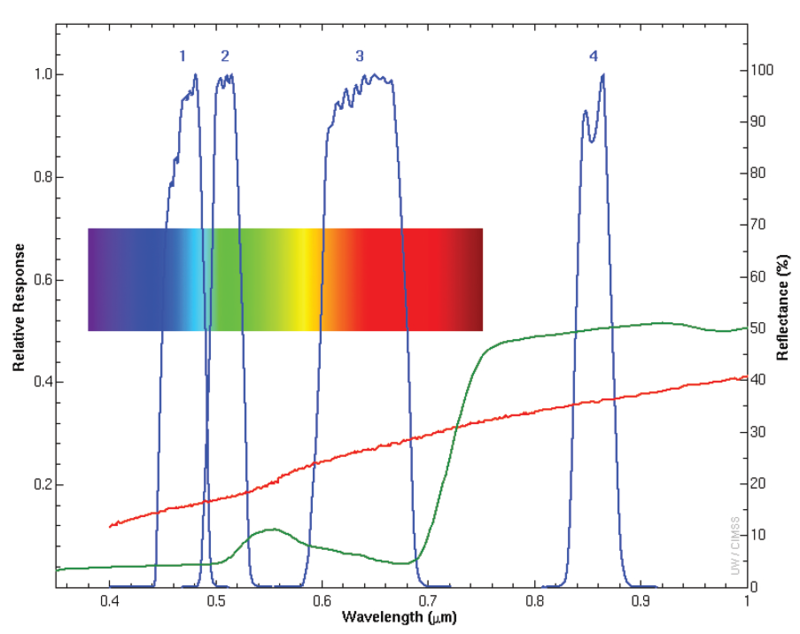 Fig2: Color spectral bands of the AHI sensor. In Fig. 2, the reflection component of green vegetation is shown as a green curve. It can be seen that there is no EM band in the AHI sensor in the visible range just where there is a peak of the vegetation radiation. Therefore, the sensor is blind for this color range. However, it can also be seen that the vegetation has a high signal in the near infrared region at channel 4. With the help of channel 4 data in the near infrared range, the missing data of the green band can now be partially reconstructed by mapping a portion of this band into the green band. Fig3: AHI Image from the channels 1-3: The green of the vegetation is missing. Fig4: AHI Image from the channels 1-4: The green of the vegetation is reconstructed. At 02:40 UTC on 24 January 2017, the first images from all 16 bands were captured by JMA's Himawari-9 geostationary meteorological satellite, which was launched on 2 November 2016. Image in full resolution available. 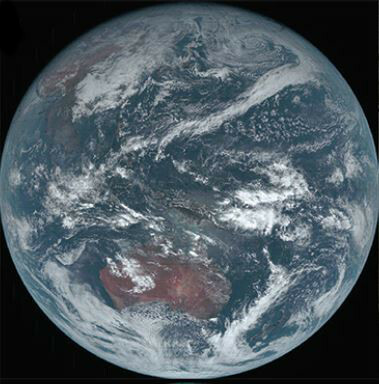 At 02:40 UTC on 18 December 2014, the first images from all 16 bands were captured by JMA's Himawari-8 next-generation geostationary meteorological satellite, which was launched on 7 October 2014. Image in full resolution available. On December 16, 1992, the Galileo spacecraft looked back from a distance of about 6.2 million kilometers to capture this remarkable view of the Moon in orbit about Earth.